MILAN (AP) — Giro d'Italia organizers have announced a deal with the Sicilian region to hold three stages on the island next year and the Grand Tour's start in 2021. ROME (AP) — Should senators from Italy's anti-establishment 5-Star Movement strip the firebrand leader of the far-right League of his immunity from criminal prosecution, possibly jeopardizing the populist government in which the two parties are coalition partners? ROME (AP) — Europe's latest migrant standoff came to a conclusion Thursday as 47 migrants kept at sea for nearly two weeks while Italy pressured European countries to take them in finally disembarked from their rescue ship in Sicily. The 47 migrants kept at sea for nearly two weeks as Italy pressured European countries to take them in have begun disembarking from their rescue ship in Sicily. Europe's latest migrant standoff came to a conclusion Thursday in Catania as the Sea-Watch 3, operated by a German aid group, pulled into Catania's port and the migrants were being taken ashore to be identified and processed. ROME (AP) — Italy has decided to ask the European human rights court to rule that the Netherlands must deal with a Dutch-flagged migrant rescue boat stranded off Sicily. ROME (AP) — Italian lawmakers boarded a migrant rescue ship within eyeshot of the island of Sicily on Sunday to inspect conditions for 47 men and boys nine days after they were rescued in the Mediterranean Sea. The ship operated by German humanitarian group Sea-Watch picked up the migrants on Jan. 19 in waters off Libya. It was allowed to shelter Italy's territorial waters due to threatening weather Thursday, but the government refuses to let aid groups disembark in Italian ports. ROME (AP) — Three United Nations agencies appealed Saturday to Italy to allow 47 migrants off a private rescue ship after a week in cold weather and decried a "'boat-by-boat" approach that keeps vulnerable asylum-seekers at sea while European nations squabble. Sea-Watch 3, operated by a German aid group, could be seen about a mile offshore from Syracuse, Sicily as fishermen, priests and others turned out for a solidarity rally in support of the stranded passengers. MILAN (AP) — Italy pressured the Netherlands on Friday to accept 47 migrants, including eight unaccompanied minors, who have spent seven days at sea aboard a humanitarian rescue ship that has been allowed to enter Italian territorial waters due to bad weather conditions. MILAN (AP) — Police in Sicily have arrested a 32-year-old Italian convert to Islam on terrorism charges for allegedly inciting contacts to participate in a holy war. The news agency ANSA reported Wednesday that the suspect, identified as Giuseppe D'Ignoti, converted in 2011 while in jail and after his release identified himself as Moroccan and used Yussuf as his first name. Italian police say they have broken up a migrant-smuggling ring allegedly organized by Tunisian extremists. Carabinieri police in Sicily's capital said on Wednesday that some suspects were under investigation for allegedly advocating terrorist acts as well as aiding clandestine immigration. They say warrants were issued for 14 suspects in Sicily and one in northern Italy, with several arrests made. 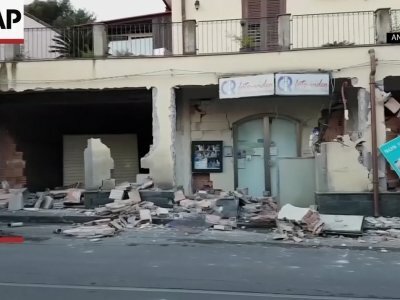 ROME (AP) — An earthquake triggered by Mount Etna's eruption jolted eastern Sicily before dawn Wednesday, injuring at least 10 people, damaging churches and houses on the volcano's slopes and prompting panicked villagers to flee their homes. ROME (AP) — Italy's Catania airport resumed full operations a day after an ash cloud from Mount Etna's latest eruption forced it to shut down, while fiery red lava could be seen shooting from the volcano in eastern Sicily on Tuesday. Ashes coated streets and sidewalks in the mountain towns of Zafferana Etnea and Santa Venerina. No evacuations of residents, many of whom work on farms or in tourism, were ordered. ROME (AP) — Anti-Mafia authorities in Sicily on the trail of the No. 1 fugitive Mafia boss have confiscated 1.5 billion euros ($1.67 billion) in property. The seizure of tourist resorts, a 21-meter (70-foot) yacht, companies and other property Saturday was called one of the biggest hauls in Italy's strategy to weaken criminal syndicates by going after ill-gained wealth. ROME (AP) — Italian prosecutors have ordered the seizure of a migrant rescue ship and accused the aid group Doctors Without Borders of illegally disposing of 24 metric tons (26.5 tons) of medical and contaminated waste accumulated during nearly 50 rescues. ROME (AP) — An Italian Catholic priest who considers Pope Francis an antipope and claims to have supernatural communications with angels, saints and the Madonna has been excommunicated. The archdiocese of Monreale, Sicily said the Rev. Alessandro Minutella was informed Tuesday of his excommunication for spreading "heresy and schism." Monreale Archbishop Michele Pennisi issued a public notice in 2015 warning the faithful that they risked "grave danger to their souls" by listening to Minutella. PALERMO, Sicily (AP) — The U.N. envoy for Libya said Tuesday he was encouraged by support from Libyan factions and the international community for a national conference planned for early 2019 to chart a path to greater stability and elections in the lawless country. Ghassan Salame praised the "louder sound of unity" among key regional players and "a much higher level of conviviality" between Libyan rivals that he sensed during a two-day meeting in Sicily. A Sicily prosecutor has opened a preliminary investigation into allegations a U.S. warship, the USNS Trenton, delayed rescuing migrants from a sinking dinghy from which some 76 people drowned in June. The June 12 rescue off Libya came at a tense time on the Mediterranean, with Italy's new populist government refusing to let aid groups dock in a bid to dissuade them from rescuing migrants. PALERMO, Sicily (AP) — Pope Francis appealed to Mafiosi to renounce their quests for power and money as he visited Sicily on Saturday to honor a priest slain by mob henchmen for trying to protect youths from the evil clutches of organized crime. PALERMO, Sicily (AP) — Pope Francis is recommending a Christian kind of populism after being attacked by Italian politicians for defending migrants. GANGI, Sicily (AP) — Far from the packed beaches of Sicily's busy coastlines, there's a quieter and wilder world in its high mountains. In more dangerous times, this was where much of Sicily's population settled, building castles, towns, monasteries and churches on steep slopes and the tops of mountains as protection against invaders and pirates. The United Nations' refugee agency says it's relieved that the latest Mediterranean Sea standoff over migrants is over, but is calling again for Europe to establish procedures for the proper disembarkation of people rescued while trying to reach the continent by water. ROME (AP) — Many of the 150 migrants stranded aboard a coast guard ship for a ninth day began a hunger strike Friday out of frustration that Italy won't let them disembark in Sicily unless fellow European Union nations first pledge to take them, authorities said, in the latest standoff provoked by Italy's anti-migrant interior minister. ROME (AP) — A delegation from Italy's rights office on Thursday visited the 150 migrants who have been kept onboard a coast guard vessel for days and concluded they were being held unjustly. The comments challenge Italy's anti-migrant interior minister, who has declared that no migrants whom he considers "illegal" will set foot in a Sicilian port. CONTRADA PETRARO, Sicily (AP) — They come in the middle of the night and are gone by morning. But without fail, they leave their calling cards: Pronged footprints and gashes in the ground where they've dug with natural abandon. This nocturnal troublemaker in mountainous northern Sicily is the "cinghiale," the wild pig, a bane to those who tend a garden. ROME (AP) — Sicilian gangsters dropped 25-kilo (55-pound) cast-iron weights on the limbs of drug addicts, alcoholics and other vulnerable people to obtain insurance payments for fake car accidents worth hundreds of thousands of euros, police said Wednesday after making 11 arrests in the case. The captain of a private aid ship that engaged in migrant rescue missions is accusing Italy and Malta of hiding a deadly "farce" in the Mediterranean Sea. Claus-Peter Reisch, who faces trial in Malta for allegedly captaining a ship that wasn't properly registered, said Monday in Munich that he's done nothing wrong. Italy's hard-line, anti-migrant government had kept the two military ships from docking at Pozzallo for two days until other countries stepped up in the latest standoff forced by Italy over migrant rescues. ROME (AP) — Another day's worth of food and beverages was sent Sunday to a pair of military ships off Sicily as Italy waited for more European nations to pledge to take a share of the hundreds of migrants on board before allowing the asylum-seekers to step off onto Italian soil. Germany, Spain and Portugal each agreed to accept 50 of the migrants, following similar offers by fellow European Union members France and Malta on Saturday, Italian Premier Giueseppe Conte said. ROME (AP) — Italy and Malta squabbled Friday over who was responsible for rescuing 450 migrants crowded aboard a fishing boat in the Mediterranean as the vessel, apparently not seeking help, headed toward a tiny island off Sicily. Italian Transport Minister DaniloToninelli had tweeted that Malta was obliged under maritime law to rescue the migrants since they were in the Maltese search-and-rescue area earlier on Friday and also provide the fishing boat with safe harbor. Malta says a fishing boat with some 450 migrants on board was in Italian waters when it learned about the vessel so it's not up to Maltese authorities to carry out a rescue. Italy said Friday that Malta was obliged to save the migrants from a boat launched by Libya-based human traffickers. Italy's transport minister said Malta must let the ship dock. An Italian coast guard ship has docked in Sicily but is still awaiting permission to disembark its 67 migrants, after two of them were accused of threatening their rescuers if they were taken back to Libya. ROME (AP) — Italy's request to modify the terms of a Mediterranean naval mission focused on disrupting human trafficking can be discussed during an ongoing strategic review, European Commission officials said Monday. Operation Sophia, an EU military operation, is in Italy's crosshairs after one of its vessels docked in Sicily with 106 migrants aboard over the weekend. The mayor of a Sicilian port town says he has received approval from Italy's interior ministry to let a Danish-flagged container ship dock with more than 100 migrants aboard. The Alexander Maersk has remained off the coast of Pozzallo for days after taking part in a rescue Thursday of migrants leaving Libya on smugglers' boats. CONTRADA PETRARO, Sicily (AP) — Spring is ending and summer approaches. The grass is now long, finished growing. For us, it's time to scythe. VALENCIA, Spain (AP) — An aid group's ship and two Italian military vessels docked Sunday at the Spanish port of Valencia, ending a weeklong ordeal for hundreds of people who were rescued from the Mediterranean Sea only to become pawns in a European political fight. France's Interior Minister says the country's office in charge of asylum will send a team to Spain to identify refugees from the rescue ship Aquarius who could be eligible to come to France. Minister Gerard Collomb's statement on Saturday didn't say how many of the 630 migrants being transferred to Valencia, Spain, from the Aquarius and two Italian government boats might be allowed to come to France. A German humanitarian group says it is declining to take aboard 41 migrants rescued by a U.S. Navy ship because Italy has refused to assign the group's ship a port where it can dock.